This quote resonates to the core of my being. I strive to learn something new every single day. Whether it’s a new household hack or something related to my job, my mind is ready for knowledge and improving my current skills. It doesn’t have to take a ton of time nor require much sacrifice beyond a willingness and desire to try something new. I didn’t care for the social part of high school, but I loved the educational part of it. I wanted to stay in school as long as I could and in a way I did. I’m 38 years old and have been in school in some way or another since I was four years old. I’ve done both college and university, the traditional way by attending a physical institution. I’ve also pursued my education online taking courses on a variety of subjects over the years. Going back to school the traditional way is not an option for me at this point in my life. I’m super busy! I have a full-time job, two kids and a household to run. Moving to be closer to a school is not an option nor do I want to travel. I also have chronic pain so I cannot sit in a hard chair in a classroom for any prolonged length of time. What is a fabulous option for me, as a busy mom, wife and businesswoman, is an online education. In fact, it’s what I’ve already been doing for years. If you are like me and want to further your education for any reason (personal, professional or just because), you CAN! 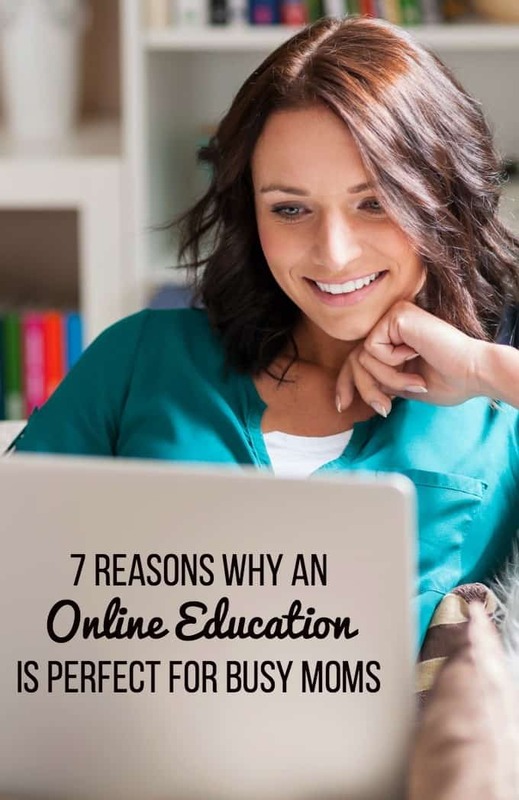 I’ve got 7 reasons why an online education is perfect for busy moms and how it can easily integrate into your current family situation. 1. You can have the best of both worlds. With an online program, you can do your school work when it’s convenient for you. Concordia University Wisconsin has online programs designed specifically for busy adults. They believe you don’t have to sacrifice your duties as a mom, wife, sister or friend to pursue your education. With that in mind, they designed their programs to help you keep your life in balance. 2. Pursue a new career while you are still working. If you’ve always dreamed about a specific career, what is stopping you from going after what you want? With an online education, you can still work at your present job and take your courses at home in your spare time. Before becoming a blogger, I worked as an accountant and was not happy. I always thought about studying nursing and would have more than likely done that had I not started on my current path. I noticed that Concordia University Wisconsin has a Nursing School too! 3. Upgrade your current job. On the other hand, you could be happy with your current career choice, but would like to further your training for a raise or promotion. Take a look at Concordia University Wisconsin’s offerings; they have a wide range from free MOOCs or email courses, low price Academies to full degrees (Bachelors to Doctorate). 4. No daycare required. The toughest part of going back to school after my daughter was born was finding a reliable, trustworthy babysitter. It wasn’t cheap and I worried about her all day long. I felt bad leaving her, but back then, online education wasn’t an option. If I had a baby today and wanted to go back to school, I would forget finding a babysitter and go the online route – no doubt about it! 5. You make the schedule. One of the biggest perks of online courses was being in control of my time. I used to complete my school work in the evenings when the kids were in bed and also for a few hours on the weekend. It was nice to have that flexibility. 6. Be a role model. Your kids are watching and they will see you working hard and going after what you want. I remember my dad taking mail-in courses in the 80’s for his insurance business. He set an example of being a lifelong learner and I think that’s where my own desire stems from after watching him. 7. Receive world-class support. You may think an online education means you are isolated and “on your own”. Though you are setting your own schedule, you are certainly not alone. Concordia University Wisconsin is there to support you in every step of your education. They have Student Support Advisers that are there to help you when “life happens” as it often does. They are your liaison who can give you advice on classes, help you find your way around the online system and be your advocate if you are having any issues. Going back to school later in life is easier nowadays thanks to technology and schools like Concordia University Wisconsin. Check out their website and learn more about their online programs and see if your new career path may be waiting for you! Have you ever considered going back to school? I love this blog! Thank your this… There are so many wonderful, accredited online university and college programs perfect for busy moms, busy women… I did my second BA, Masters online. I am now working on my PhD. This is just what I need to do is work on my education from home thank you for sharing I couldn’t go back to a school setting at 47 I would feel too old this is the way I need to go. When I was in college, I took a few classes online. I loved the flexibility that they afforded me. Definitely! You have the freedom of a little more time, and can still spend the quality time with your family. I have a lot of respect for moms that go back to school online! i am and have been planning to go back to school once all my kiddos are in school full time. this is great, and something I could for sure do! That sounds great! I think an online education would be great for anyone with a limited amount of time. I love the direction online education has gone. Thank you for a thought provoking run down. Too often we tend to write off online studies as “not real” or “doesn’t count”. Thank You for letting this reader see otherwise. Also good for disabled people. I actually got my BA from mainly online courses too. I found them very convenient and truly helpful to continue my education. My hubby wants to go back to school and doesn’t have a lot of time to do it. This might be a great way for him to get the education he is searching for and the time to do it. I went back to school when my kids were 9,2 and 1. I was a single parent going to school full time, working 3 part time jobs and being a parent. I had a lot of plates in the air! Unfortunately online school was unheard of in those days. I bet it would have made my life much easier! Online school for moms is the way to go! Love that it gives you the flexibility to create your own schedule. When I went back to college, it was so nice to have some online classes. Sometimes, you just don’t have the time to go to a traditional classroom, right? I know this would be a great idea for me. I still think about online education, but I wouldn’t know what to go for. I love blogging, so maybe I could go for something that could help me out there. Maybe writing or something. I think online learning is a great option for busy Moms. It is a great way to continue your education so you can get a better job when you are ready to go back to work. I have been thinking of looking at what classes are available online. I would love to update some of my skills. Being able to work online from home is a great option for me. I love that you can work on your own schedule. Life can be to hectic when you have little ones to commit to a certain time every day. One of the best things about modern technology is that it makes things like this possible. Online educational programs make it possible for you to learn, interact with professors and classmates and keep up with your family and professional obligations. These online classes seem like a great idea. An online education is nothing to look down upon! We get busy and getting a degree online is a great way to be there for your family at the same time as expanding your mind. I actually have been thinking about doing this! Your article about online education is really inspiring. I love taking courses. I’ve taken night school courses and self-paced courses in the past. But these days computers have changed everything.